Millie – a coiled spring! The new environment sets the dogs new challenges such as having to deal with outdoor air flow affecting the target scent and differing temperatures which also has an affect on the scent pattern. Conducting this type of exercise builds in realism for the dogs but as trainers we make sure that each exercise is within the dogs limits of experience. 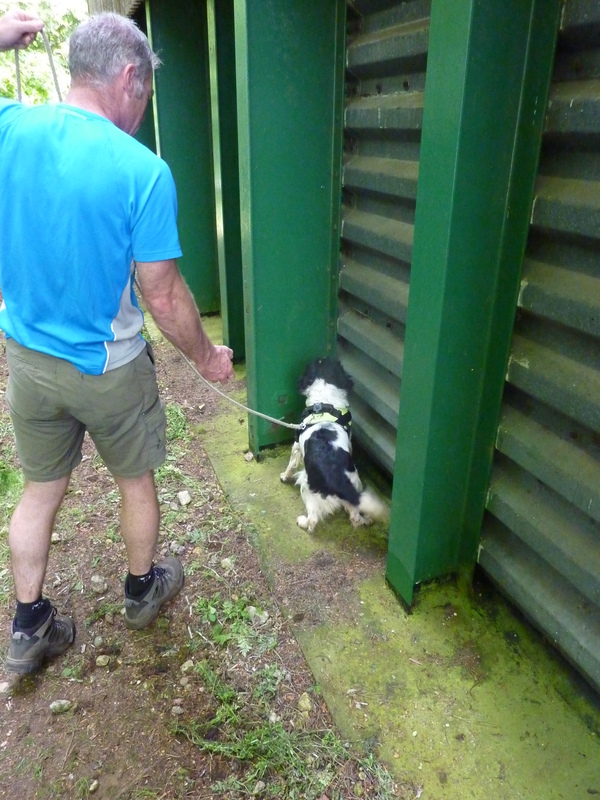 The searches are only lasting a few minutes and within that time the dogs are given 2 or 3 rewards on the scents that they have already been exposed to in earlier weeks. The amount of scent is still just a few drops and we encourage the dog to indicate to within a few centimetres of the source, as we have been since day one. 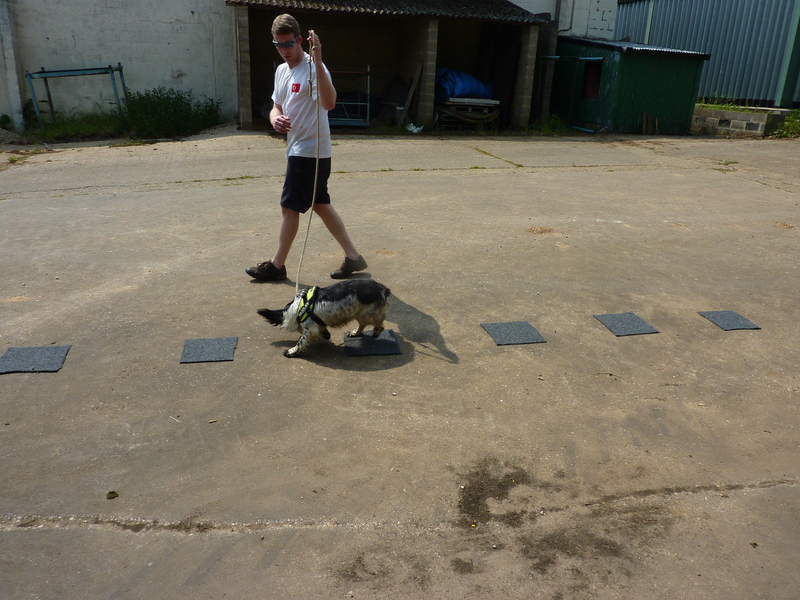 The dogs have been giving us a few challenges along the way as they are still developing their indication at this stage. For example Geoffrey on occasion will become impatient when indicating and bark, he has also tried to give a pro-active response by pawing at the hide. As long as he doesn’t get rewarded for this inappropriate behaviour, and only gets rewarded for the behaviour that we are wanting from him (a stand and stare a few centimetres from the scent source) then it will in time subside, and we will get more and more success from him. This is the basic principle for operant conditioning which we remind ourselves of on a daily basis! 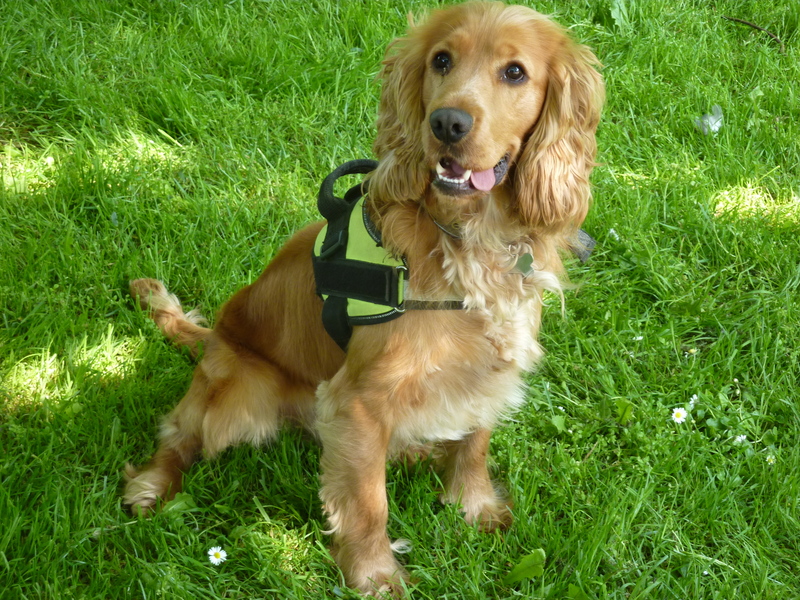 Millie is working very well and has made the progression to working outside with ease. 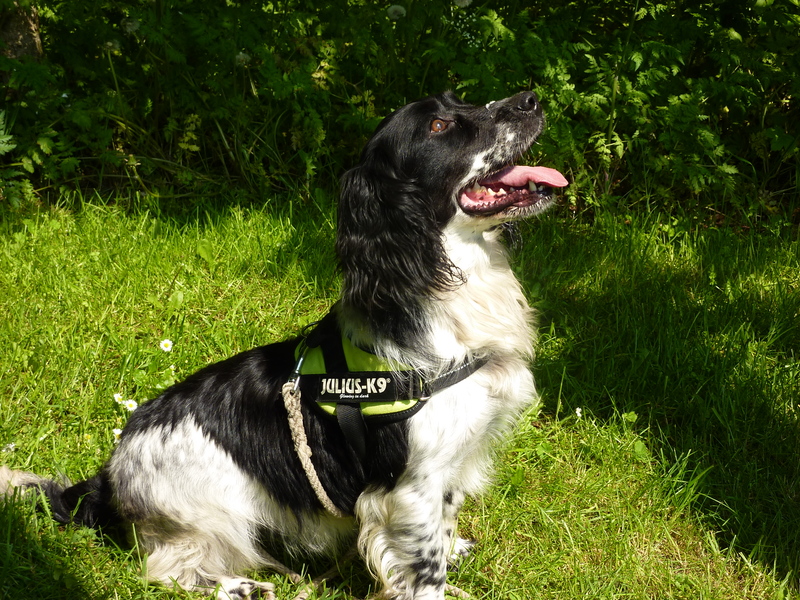 Her indication is improving daily and she is looking every inch the search dog that we are hoping for! Mansell and Lucy are the dogs that are causing us most cause for concern. We are having problems consolidating Mansell’s indication, and his concentration is very erratic within each training exercise. Lucy also has concentration issues, which at this stage isn’t a good indication for their future prospects as search dogs. We are aware that they are both young dogs and we are hoping that as we develop the length of time in harness over the coming weeks that their concentration will improve. 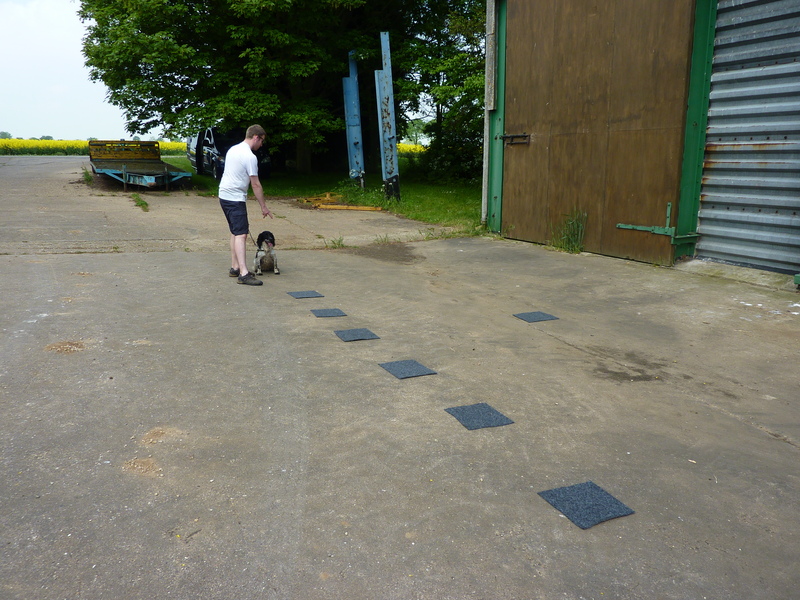 We have also been developing the discipline of working the dogs on a series of carpet squares, as shown in the series of pictures below…..
A controlled position to start…. 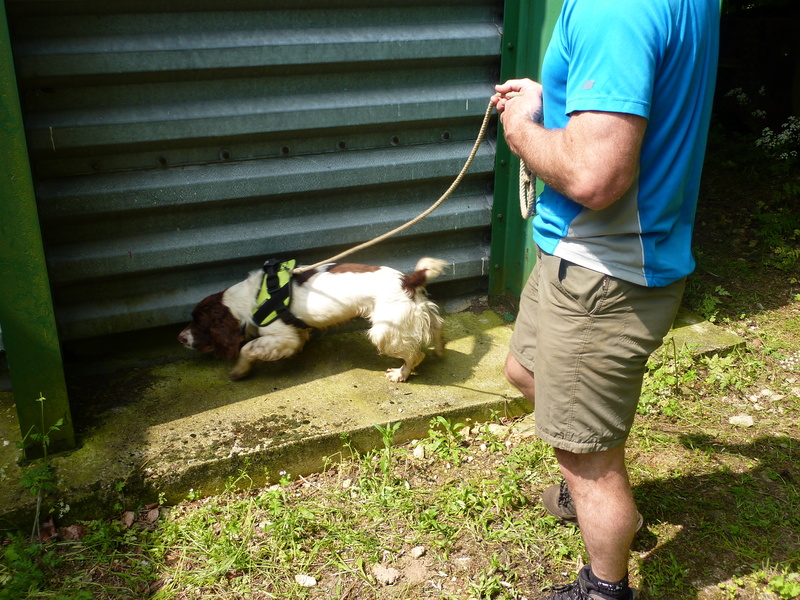 Concentration and a steady working pace is needed……..
A great check step from Millie as she recognises the target scent……. A super indication, focused and steady before being rewarded. Note that the ball delivery is from close in and not launched from a distance – this is critical in the success of a focused indication…….. 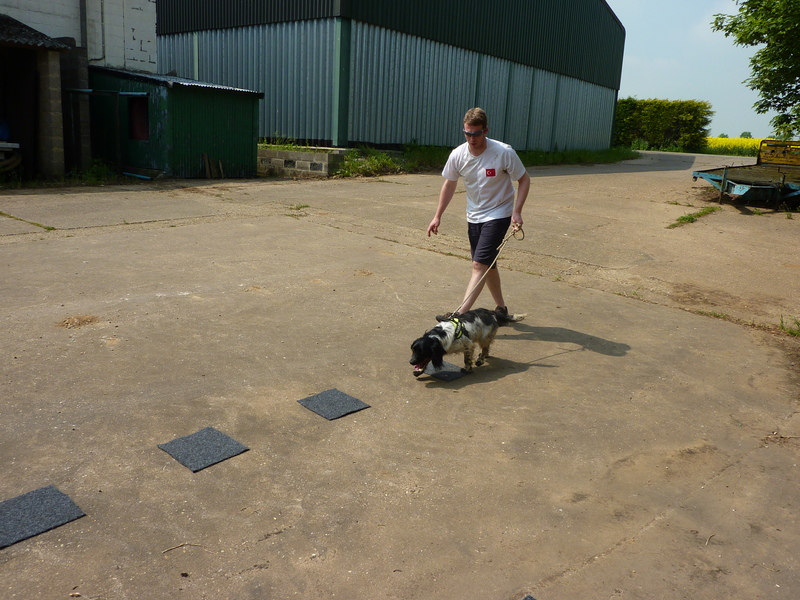 The carpet exercise is a great way of discipling the dogs to work with their nose down as well as help consolidate their indication away from the initial block stage of training. 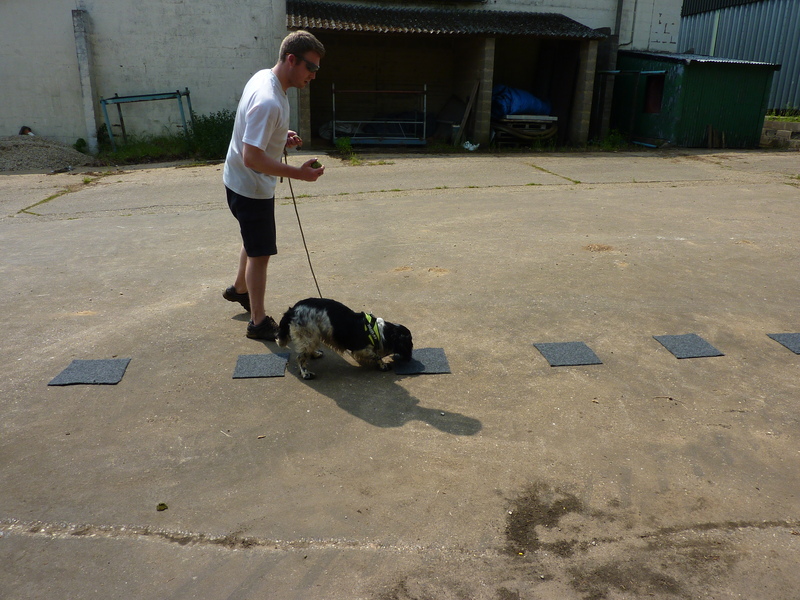 It also allows the dogs to work out scent flows and track the scent to source. The last picture above demonstrates a great indication from Millie and shows the proximity the indication in relation to the scent source.